I can't drive. And I had been hit by a car. I have not been interested in car though not for this reason. The cars is only transportation device for me. So I see only the bad-point what people can (or will) not see though I may not know the good-point of car. I thought about the car. The streamline shape is beautiful. But I am sick to the back teeth of the product as the car. Although the cars are not good for us, I feel the car as social status. But the cars have various qualities. As result the industrial of car developed. Because the industrial is so big, we will not deny the cars though many problems happen. I feel that it is momentarily too difficul for us to deny the cars. Of course, I use bus and taxi. Now, the energy of the cars is moving away from gas towards electric. The problem what the cars may be dangerous for walkers happens in consequence of change. Many people will perceive this problem future. And I thought up this plan. The plan solve the problem and make us think better of　the car. The electric caes have the wheels included the system of sound like a music box. When the speed of car is low, the sound is low-pitched and low-tempo. 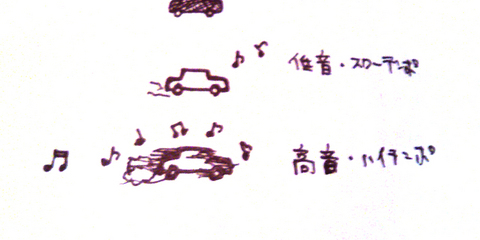 When the speed of car is high, the sound is high-pitched and high-tempo. We can't choise the kind of sound. The sound is stereo or surround. The system turn up the sound a little in the night and turn down the sound a little in the midnight. The system has humorousness and nuisance. The system makes our craving for the car down. And we think that the gas-car is better than electric-car. But the number of electric-car produced gradually become larger than that of gas. Then people think again whether we need the car. And the new needs will appear. The new transportation device will appear, too. I hope that the industrial of the car create a new system because they are so big.